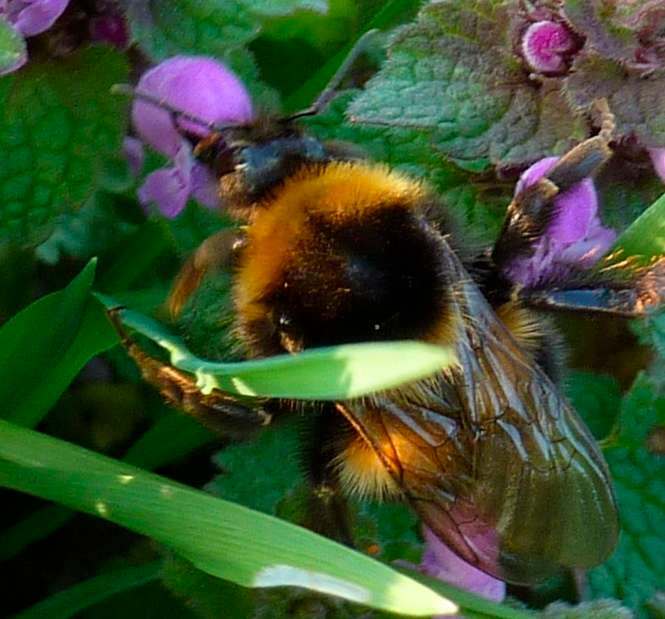 permaculture in brittany: Busy, busy bees. Albert Einstein is reputed to have said that, “If the bee disappeared off the surface of the globe, then man would only have four years life left. No more pollination, no more plants, no more animals, no more man.” In their fascinatingly worrying book, A World Without Bees, Alison Benjamin and Brian McCallum reckon that, “In truth, it is more likely to have been French beekeepers who put these words posthumously into Einstein’s mouth a few years ago during a battle to get a pesticide banned from their country.” Whoever said it, what is it all about? It seems then, it is a responsibility to raise bees but it’s also been a longstanding dream of Gabrielle’s to add these tiny beasts to our livestock. With so much going on, and ducks also on the list of this year’s ambitions, I thought a breeding pair would be enough but talk was of a swarm, thousands of the buzzy buggers. 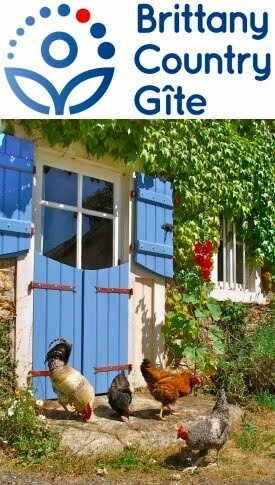 Registered for our sheep and pigs, we would also have to inform officialdom of our beekeeping and get yet another holding number. Fine, as long as I don’t have to ear-tag all our bees! The new phenomenon, Colony Collapse Disorder, is, as yet, un-hundred-percently-explained, although we do know that bees are stressed from many directions, such as pesticides, viruses, Varroa mites, aggressive Africanised bees, fungi or just trucking them thousands of miles to pollinate successions of monocrops. Take a moment to consider their reality and wonder how that would work out here. Can you imagine the local job centre filling their vacancies for ‘fruit tree pollinating’ for the minimum wage? Having read loads, Gabrielle is interested with the Abbé Warré method of raising bees but we have decided that the best way to start is with a mentor, step forward local apiculteur Jean Meilleur, and thus the simplest approach seems to be to go with what he’s used to, i.e., a standard French Dadant hive. 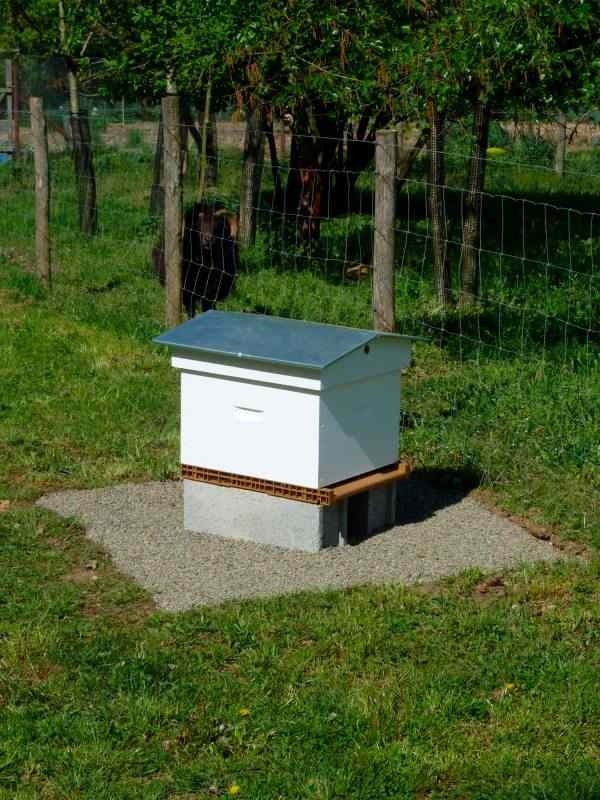 Once we know what we’re about, bee-wise, and when we have a need for a second hive, we might then build a Warré hive. The kindly Monsieur Meilleur met us at the supplier of beekeeping equipment to help us choose the right things, even negotiating a little discount for us. 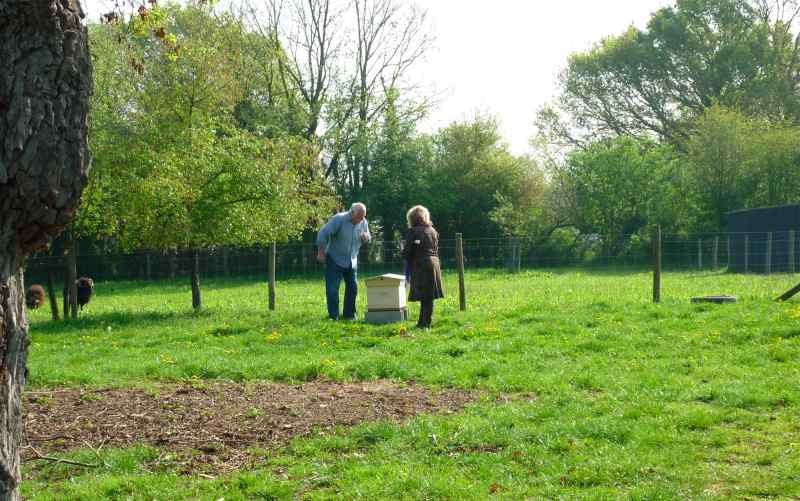 He then followed us home to help us find the right location for the hive, where our bees wouldn’t bother our neighbours. I’ve painted the exterior of the hive in white , mounted it on a couple of concrete blocks and smeared some “charme abeille” (bee perfume) inside to attract passing swarms. If this plan fails to work, then Monsieur Meilleur will bring us a swarm when he next has one. It’s still a little early in the year for a swarm but we’ll be sure to post news when our bees arrive. I look forward to the honey! I, an urbanite, have long recognised the bee crisis and was fascinated to read what happens when there are no bees to do what bees do so efficiently. I have a feather duster. Will that work?